This week, our continuing quest to try all 100 foods a DC Omnivore must experience checks out calamari. Ok, maybe not. But this versatile cephalopod is truly a wonder of the sea. 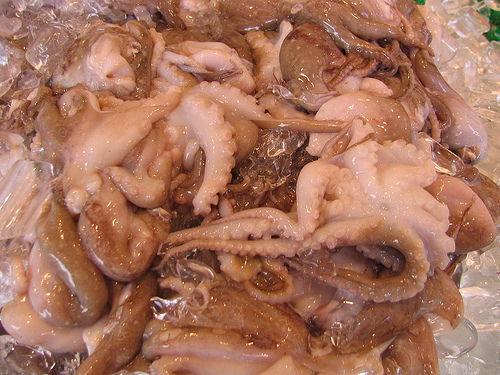 There are a myriad ways to prepare squid – fried, grilled, stuffed, with the tentacles or not (no tentacles? wimp!). Squid ink makes a glorious rich pasta and salty sauce that can stain your tongue black as night. Raw squid as sushi can be disconcerting or refreshing, depending on your palate. My personal preference is sauteed or grilled. Perfectly prepared squid should not be overly chewy – it should have an initial ever-so-slight firmness that dissolves into a fresh from the sea taste. When I was a poor little match girl just out of drama school, I discovered I could get squid quite cheap and saute up a batch for both me and my cat (wow. that is a depressing memory!). But now if I cook calamari, it’s for a luxurious seafood pasta with squid, shrimp, and scallops. The trick? Make sure the calamari’s clean, beak removed, and remember: there is nothing worse than chewy overcooked squid (except maybe chewy overcooked mussels). So be gentle, be quick! Rustle them up very briefly, we’re talking a minute here, watching the color change from translucent to white – then stop immediately! Of course, if the thought of messing up a dish of calamari freaks you out, there’s no shame, just go out to eat. There are plenty of places in DC to experience the many options of squid. 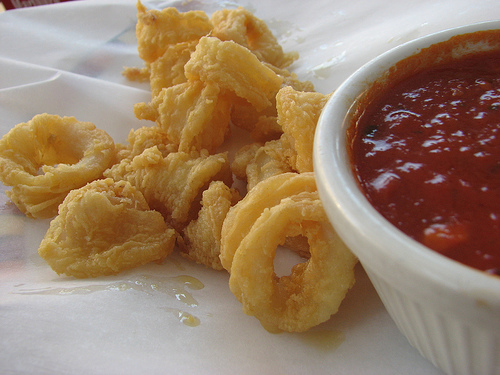 Every decent Italian restaurant in the city has a classic version of fried calamari with marinara sauce, too many to name (but Sette’s is pretty near perfect). Others will gild the lily, like The Heights whose fried version is drenched in ginger. Beyond the usual fried method, it seems every cuisine has made its mark in exploring squid’s versatility. Tosca currently has calamari featured in both gnocchi and risotto, and Bistro d’Oc matches squid with mushrooms and chorizo in a delicious Catalan fricassee. Go crazy and get Soupa Poseidon – squid ink soup – at Mourayo, where you can also try other cephalopod family members like cuttlefish or octopus grilled. Or get Ika Yaki or Ika Geso Yaki before diving into some sushi. And of course who can forget the Thai version that drenches squid with chili, lime, and cilantro – the addictive Yum Talay that I can never resist at Haad Thai. The choices are really endless, so dive in! I just entered a long and comprehensive comment, and when I tried to submit it my Internet Explorer freaked out. Did it come though or do I need to retype the whole thing?